Traditional grill brushes cannot reach the sides or bottom of the grill, leaving food debris behind where it gets cooked into your next meal. 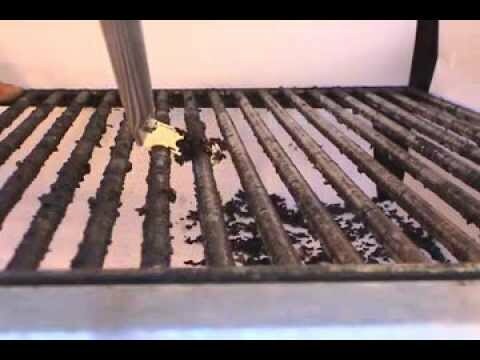 GrillFloss is the only grill cleaning tool that reaches around and cleans all sides of each grill grate. It is safer to use than any grill brush, since there are no bristles that can rub off and get into your food. With a simple push, turn and pull, GrillFloss wraps around each round grill grate, scraping tough caked-on charred debris. It also features stainless steel construction for lasting durability and a cleaning head that comes in two sizes. It includes four cleaning head sizes to fit all round grill grates. To access the larger size, unscrew the cleaning head, flip it around and re-tighten the screw. GrillFloss is not recommended for use on porcelain coated grill grates. GrillFloss warrants their products to be free of defects in material and/or craftsmanship for a period of ninety (90) days.